The hamlet of Dalwhinnie, and its distillery, lie to the west side of the A9 close to the junction with the 'notorious' A899 to Fort William - recently classified as one of the most dangerous roads in Scotland! The A9 was originally built by General Wade in the second half of the 18th Century as the preferred route through the Grampians between Atholl and Badenoch, superseding the previously used Minigaig. Still one of the classic Scottish walks in its own right, the 28 mile/45 km Minigaig Pass - one of the longest, highest and oldest of Highland through routes - links Blair Atholl, ancestral home of the Dukes of Atholl, in more or less a straight line northward, with Ruthven Barracks, site of an ancient stronghold of the Comyn family, not far from Kingussie and was a favourite route of the drovers on their annual journey south to the Crieff and Falkirk trysts (cattle markets). This part of Highland Scotland is a sparsely populated and desolate place especially in the winter - or inclement summer - weather but the area draws thousands of tourists annually, from all over the word, to marvel at the sheer beauty of the spectacle these hills create - and to taste the Dalwhinnie whisky! Walking away from the relative safety of the roadside into the hills and surrounding area, however, should only be undertaken with great care and thoughtful preparation. 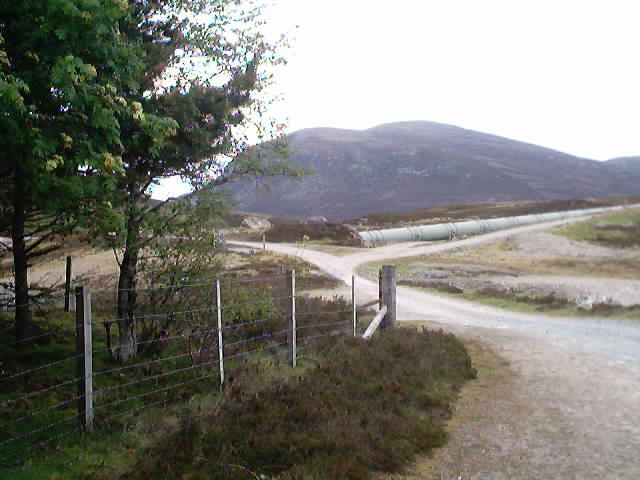 The route in to bag this Munro begins from the A9 at a gate immediately opposite the 'Private Road' leading to Chuaich Cottages. Take note of the content of the estate and Highland Constabulary signs and posters that adorn the entrance before negotiating the gate. Follow the wide, rough road up to a junction then bear left and continue for 1 mile/1.6 km alongside the aqueduct that transfers water from Loch Cuaich to Loch Ericht. 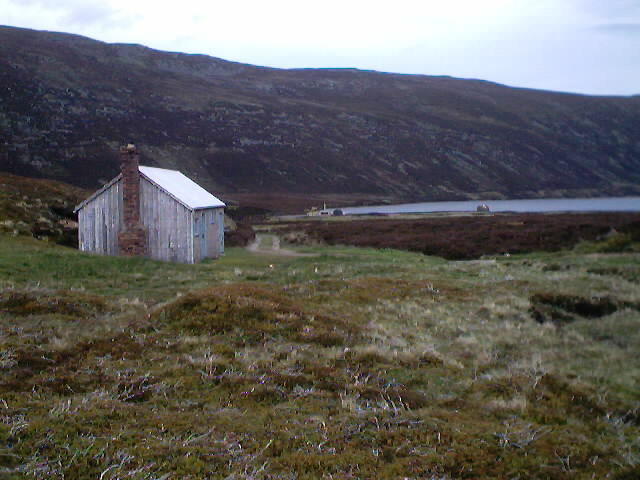 Cross the aqueduct by the second bridge then walk on past the small Scottish and Southern Energy�s Cuaich Power Station then take the track left alongside the Allt Cuaich to the locked bothy that stands a short distance from the southwest end of the loch. 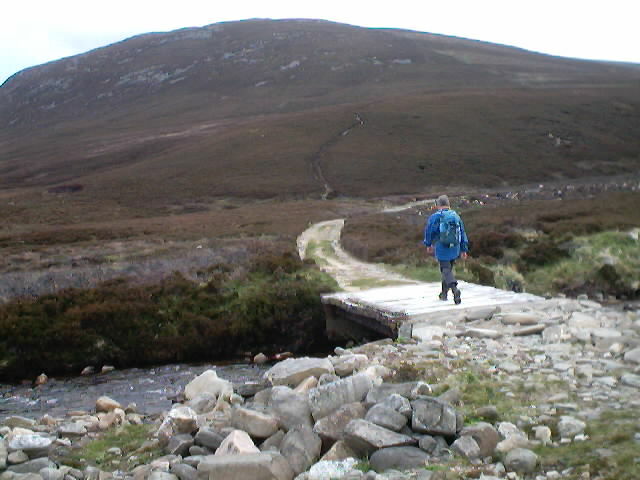 The obvious hillside track begins almost immediately after crossing the wooden bridge over the Allt Coire Chuaich. The initial section of the track comes as something of a short, sharp shock to the lungs after the relatively easy stroll in from the start but it gets easier as the climb progresses even though it is wet and muddy in places underfoot! Stac Meall Chuaich, at around 2625 feet/800m, offers an ideal vantage point on which to pause and take in the view. From here there are a few narrow tracks that can be taken which, in addition to the wider, main one, all lead up to the summit. Before enjoying that luxury however, there is a short boulder field to negotiate where, as is normal with this kind of terrain, the path becomes indistinct but then is easily picked up again once onto the short heather of the almost flat top. 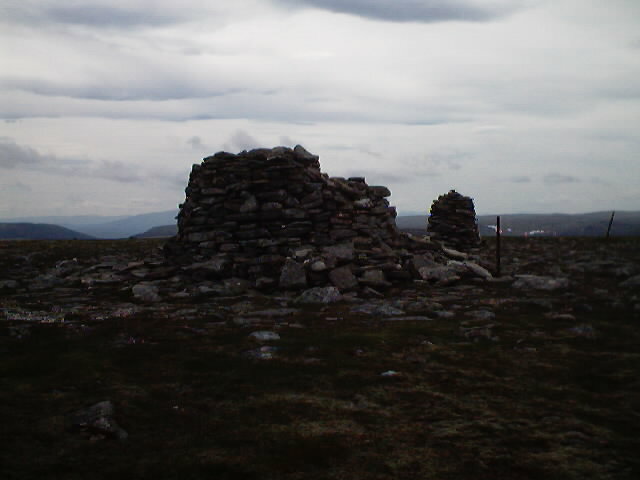 A few rusted fence posts and a large cairn mark the summit. There is also a smaller memorial cairn. Since the sides of this Munro are quite steep in places and without any obvious alternative exits, the recommended return route is the reverse of the upward one. Distance 9 miles/14.5 km (ascent: 2135 feet/651m). Map OS Landranger sheet 42. Start/parking Grass verge on the east side of the A9 to north of emergency layby. GR: NN 655867. Grading An easy route over this Munro starting from high altitude. Ideal for fit adults and older children. A good winter walk, but full weather and navigational equipment must be carried. Dogs should be kept on a lead and under strict control at all times as the route passes through a Speyside Cairngorm Deer Management Group estate.